Recombinant fragment derived from within residues 380 - 655 of Human MMP2. 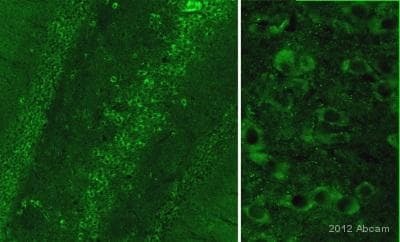 This antibody gave a positive signal in the following lysates: Human Ovary Tissue; Human Liver Tissue; Mouse Liver Tissue; Rat Spleen Tissue; A375 Whole Cell; NIH3T3 Whole Cell; PC12 Whole Cell. Our Abpromise guarantee covers the use of ab86607 in the following tested applications. WB Use a concentration of 1 µg/ml. Detects a band of approximately 75 kDa (predicted molecular weight: 74 kDa). IHC-P Use a concentration of 1 - 5 µg/ml. IHC image of ab86607 staining in Human Breast adenocarcinoma formalin fixed paraffin embedded tissue section, performed on a Leica BondTM system using the standard protocol F. The section was pre-treated using heat mediated antigen retrieval with sodium citrate buffer (pH6, epitope retrieval solution 1) for 20 mins. The section was then incubated with ab86607, 1µg/ml, for 15 mins at room temperature and detected using an HRP conjugated compact polymer system. DAB was used as the chromogen. The section was then counterstained with haematoxylin and mounted with DPX. Immunohistochemistry (Formalin/PFA-fixed paraffin-embedded sections) - Anti-MMP2 antibody [6E3F8] (ab86607)Image from Sun H et al., J Cell Mol Med. 2015;19(4):836-49. Fig 6.; doi: 10.1111/jcmm.12521. Immunohistochemical (parraffin-embedded sections) staining for MMP-2 in atheroslerotic lesions of aortic root in from right to left Ad-MIFi, Ad-EGFP, NS control and non-DM control groups using ab86607 at a dilution of 1/200.. Observed band size: 75 kDa why is the actual band size different from the predicted? Additional bands at: 100 kDa, 70 kDa. We are unsure as to the identity of these extra bands. This blot was produced using a 4-12% Bis-tris gel under the MOPS buffer system. The gel was run at 200V for 50 minutes before being transferred onto a Nitrocellulose membrane at 30V for 70 minutes. The membrane was then blocked for an hour using 2% Bovine Serum Albumin before being incubated with ab86607 overnight at 4°C. Antibody binding was detected using an anti-mouse antibody conjugated to HRP, and visualised using ECL development solution ab133406. IHC-FoFr image of MMP2 staining on rat hippocampal sections using ab86607 (1:300). The sections used came from animals perfused fixed with Paraformaldehyde 4% with 15% of a solution of saturated picric acid, in phosphate buffer 0.1M. Following postfixation in the same fixative overnight, the spinal cord were cryoprotected in sucrose 30% overnight. hippocampus was then cut using a cryostat and the immunostainings were performed using the ‘free floating’ technique. Publishing research using ab86607? Please let us know so that we can cite the reference in this datasheet.